Delighted Clipstone manager Micky Taylor celebrated the Cobras’ first league win since March 2017 and progress in the FA Cup after a remarkable five days for the club. 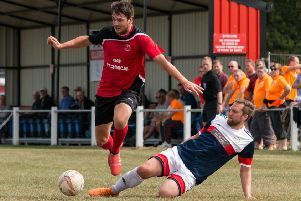 Captain Jason Gregory hit the injury-time winner at Teversal in the East Midlands Counties League (see report below) after Clipstone had fought back from 3-0 down to beat Barton in the FA Cup five days earlier. Taylor described the landmark league win as a fantastic result for the football club. He said: “He (Gregory) is captain because he is a leader. The respect the players have got for him is second to none. “It was a tight game. The first half was awful, horrible to watch, but I thought in the second half we were the better side and created maybe six good opportunities — and then scored with a fluke with virtually the last kick.